Sometimes brushing is not enough. Everyone has hard-to-reach spots in their mouth, and brushing doesn’t always fully clean those difficult places. When that happens, you are at risk of tooth decay. Using sealants on your teeth gives you an extra line of defense against tooth decay. Dental sealant is a plastic resin that bonds to the deep grooves in your tooth’s chewing surface. When sealing a tooth, the grooves of your teeth are filled and the tooth surface becomes smoother — and less likely to harbor plaque. 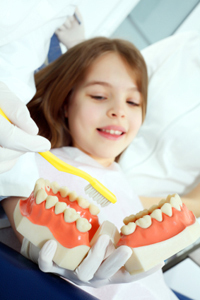 With sealants, tooth brushing becomes easier and more effective against tooth decay. Sealants are usually applied to children’s teeth as a preventative measure during the years of most likely tooth decay. However, adult’s teeth can also be sealed. It is more common to seal “permanent” teeth rather than “baby” teeth, but every person has unique needs. Dr. Ross will recommend sealants on a case by case basis. Sealants generally last 3-5 years, however it is fairly common to see adults with sealants still intact from their childhood. A dental sealant only provides protection when it is fully intact, so if your sealant comes off let Dr. Ross know.